Mumbai: A buoyant initial public offering (IPO) market has prompted investors to invest in so-called pre-IPO financing rounds as a means to placing sizeable bets on companies that are about to go public. So far this year, companies have raised at least $600 million through pre-IPO funding rounds, according to a Mint analysis. The activity has been led by large deals such as the $383 million pre-IPO funding round by a consortium of investors led by Warburg Pincus in ICICI Lombard General Insurance Co. Ltd and IIFL Special Opportunities Fund’s $60 million bet on Reliance Nippon Life Asset Management Co. Ltd. It is not just private equity funds and dedicated pre-IPO funds such as IIFL that are looking for these opportunities. Several public markets-focused institutional investors such as hedge funds, family offices and high net-worth individuals, too, have tapped pre-IPO financing opportunities. In September, Mint reported that IPO-bound Prataap Snacks Ltd had raised Rs50 crore in a pre-IPO round from public market investor Malabar Investments. In the following month, Mint reported that private equity firms Aditya Birla Private Equity and Multiples Alternate Asset Management had sold part of their stakes in IPO-bound Indian Energy Exchange Ltd to several high net-worth individuals and SBI Life Insurance Co. Ltd days before the company’s IPO. According to industry experts, one of the major factors for the surge in pre-IPO funding rounds is the need of investors to achieve meaningful allocation of shares. “Markets have been on a roll, the overall environment has been good and we are seeing a lot of IPOs coming to the market. Domestic funds are flush with liquidity, especially mutual funds. In an environment like this, everyone vies for allocation, but there is only a limited amount of stock available in an IPO," said Satyen Shah, head of Edelweiss Investment Banking. Shah added that there is strong appetite for these pre-IPO opportunities among all classes of investors. “Public market focused funds are also willing to look at these, as also private equity funds that also invest in listed entities and there are a lot of HNIs and family offices that are looking at it. There is a lot of liquidity and everyone is fighting for allocation. Pre-IPO guarantees allocation and so many investors are looking at them," he said. 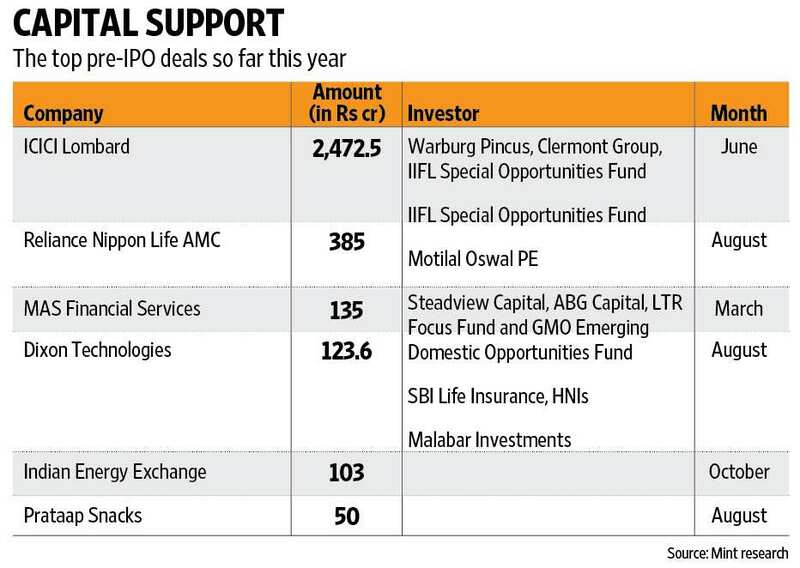 Institutions, flush with funds, are looking for newer ideas and IPOs offer those investment ideas to these investors. According to Prithvi Haldea, chairman of Prime Database group, a primary market tracker, while allocation needs are driving investor demand for these opportunities, issuers, too, have their reasons to look at such opportunities. “From a issuer perspective, getting a reputed institutional investor backing ahead of the IPO can help reduce the anxiety around raising funds through an IPO. Also, issuers can get a pricing benchmark. If institutional investors have bought shares ahead of an IPO at a particular price, then that generally appears to be good price," he said. To be sure, while pre-IPO rounds guarantee allocation, shares bought before an IPO come with a one-year lock-in from the date of listing. However, given the successful run the IPO market has seen so far, investors don’t appear to be fazed by the risk of a lock-in period, when they can’t sell the stocks. “For good companies, where the long-term prospect is good and the management is good, people are happy to take the bet," said Shah of Edelweiss.